Although the growth of commercial radio was just that, commercial, there is a tendency to regard the medium during its early decades as being an overall force for good. To be sure, the general "wholesomeness" of network programming came from the sponsor's desire to offend as few consumers as possible, and the way Radio brought the Nation together through the Great Depression and after Pearl Harbor could be viewed as exercises in propaganda, with few exceptions Old Time Radio can be considered as morally upright. The medium's treatment of the Ku Klux Klan certainly bears out this hypothesis. The Klan began in the days immediately after the Civil War. The group sought a measure of legitimacy by using the Greek term kuklos for circle as a name for their organization, but they adopted the terroristic tactics of the pre-War "slave patrols" which depended upon disguised night riders to put down slave rebellions, hunt run-aways, and keep freedmen in line. The KKK tried to build a reputation as an "Invisible Empire" and used an inefficient hierarchy based on a series of nonsensical titles. One of the early Klan's major objectives was to resist reforms to Southern politics mandated by the Republicans, and in time the South became a Democratic stronghold. However, the group's terrorist tactics were found to violate Federal law, a series of enforcement acts came from the US Congress, and the Klan was effectively marginalized. D.W. Griffith's major film, The Birth of a Nation (1915) was one of Hollywood's first blockbuster hits and led to an upswing of Klan activity. There was a good deal of native resentment toward the influx of immigrants during the early decades of the Twentieth century, and this helped to spread the Klan's influence from the rural South up the eastern seaboard and into the Industrial Midwest. This "Second Klan" period is where Old Time Radio comes into the story. During the summer of 1936, Front Page Drama dramatized the founding of the original Klan along with its night-rider tactics as an advertisement for a related story in the Heart Newspaper's Sunday supplement titled "The Invisible Empire". The next year, President Roosevelt nominated the first of nine appointments which he would make to the Supreme Court bench, Hugo Black, who would go on to have the fifth longest tenure in Supreme Court history. Black had been a very effective Democratic Senator from Alabama, and after failing to pass legislation which would have allowed him to "pack" the court, Roosevelt was determined to put a "thumping, evangelical New Dealer" on the bench. Soon after his appointment, the press revealed that Black had been a member of the KKK. During a broadcast from his home in Washington DC, Black admitted that he had indeed been involved in the Klan in his youth, but, "Before becoming a Senator I dropped the Klan. I have had nothing to do with it since that time. I abandoned it. I completely discontinued any association with the organization. I have never resumed it and never expect to do so." Black later claimed that he would have joined any organization in order to get votes. In the summer of 1946, the Institute for Democratic Education on their Lest We Forget series presented a radio play based on the life of Joseph Pulitzer, a Hungarian immigrant who fought for the Union Army and later founded the New York World newspaper. The episode revealed some of the secret ceremonies of the reformed KKK and the World's efforts to expose the Klan after the Great War. 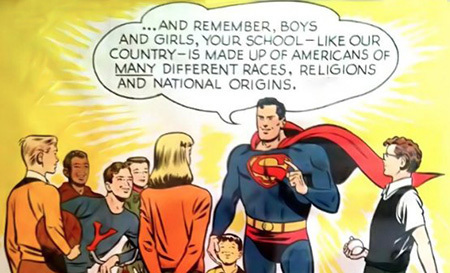 One of OTR's biggest blows against the Klan was not delivered by the journalists, however, the most influential voice in bringing down the Klan was that of Superman. Jerry Siegel and Joe Shuster's character first appeared in the pages of Action Comics in 1938 and was featured in a daily newspaper strip in January 1939, but the superhero really caught the public's imagination when the Mutual network began broadcasting The Adventures of Superman in 1940. Many of the Man of Steel's characteristics were developed for the radio series, including his catchphrase "Up, Up, and Away!" Along with many other popular fictional characters, Superman fought against the Fascists during the Second World War, but after VJ Day the writers were becoming desperate to find a new villain. That villain was presented to the writers by human rights activist Stetson Kennedy who had gone "undercover" with the Florida branch of the Klan and was anxious to share what he had learned. The organization which Superman fought was thinly disguised as "The Clan of the Fiery Cross" and did not specifically target African-Americans or Republican politicians, rather the story arc focused on the gullibility of the members and the avarice of the leadership. 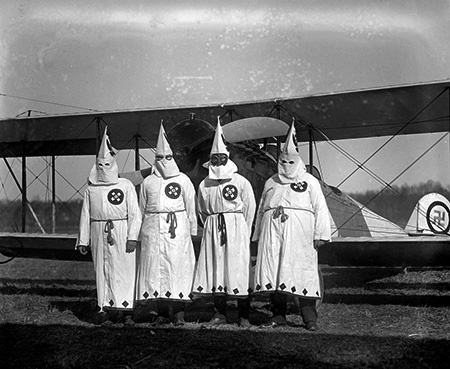 Although the Klan tried to begin a boycott against the show's sponsor, they were only made to look more ridiculous, and the public began to see the Klan as foolish. Membership recruitment fell off dramatically. By the end of 1948, as the Cold War began to deepen the government had published a list of subversive and criminal organizations. In his report for December 5, 1948, on The Jergen's Journal reporter Walter Winchell called for the Klan to be added to the list, noting that although their power had abated somewhat, their agenda of hate still made them dangerous. The Klan would rise again in response to the Civil Rights movement of the 1950s and 1960s, and face the direct attention of J. Edgar Hoover and the FBI, but the organization was seen more as a criminal and domestic terrorist front than a political organization. The Klan still has a few active members in the deep South and is thought to be only on the fringe of the White Supremacy movement. What little recruitment that goes on occurs mostly behind prison walls. Be the first to comment on "KKK in Old Time Radio"